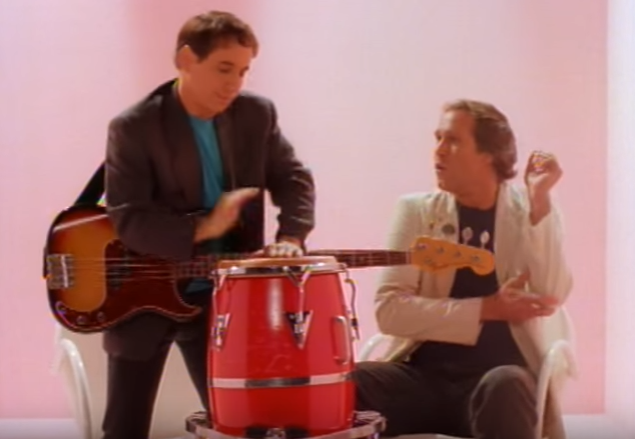 Paul Simon's most commercially successful album Graceland turns 30 this week. Led by the single "You Can Call Me Al", the album would win the Grammy Award for Album of the Year in 1987. 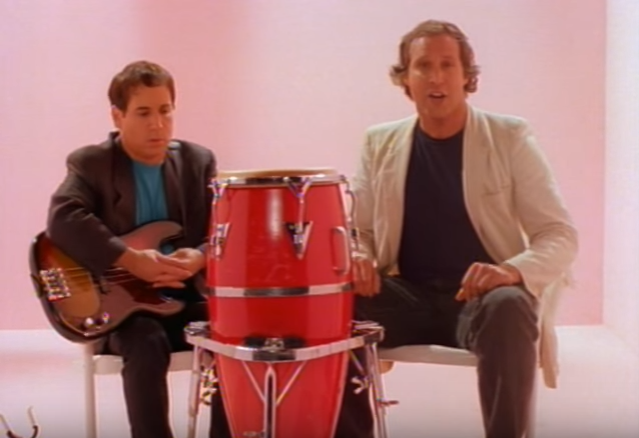 The high memorable music video for the song featuring actor Chevy Chase also added to the popularity of Simon's album. 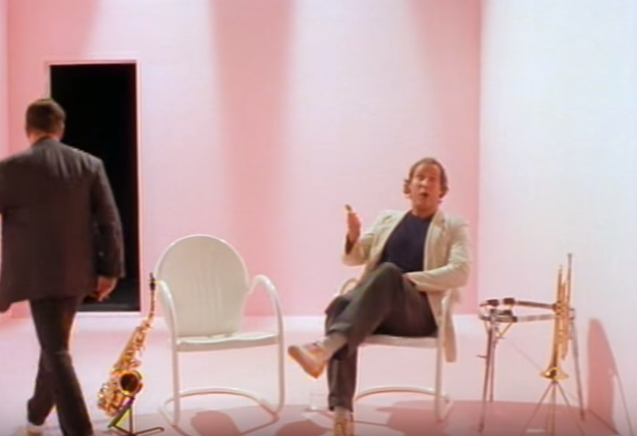 However, it wasn't the first music video that was shot for "You Can Call Me Al." 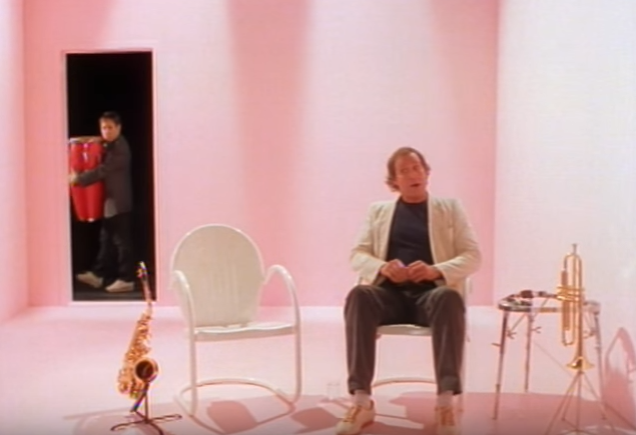 According to Wikipedia, the original music video was a video monitor perspective of Simon's performance during his monologue on SNL. 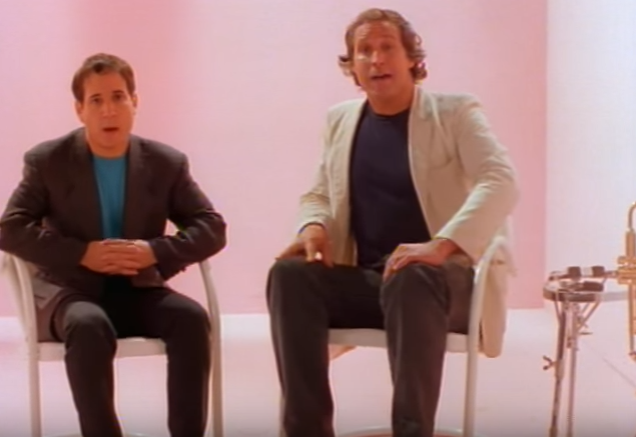 The replacement video was partly conceived by SNL creator Lorne Michaels and filmed by SNL director Gary Weis. 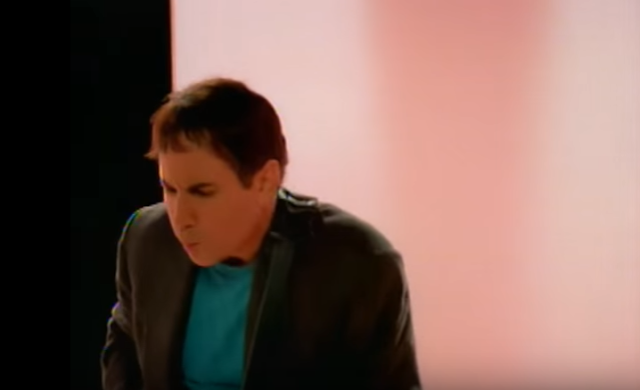 Chase's lip-sync performance is still one of the most memorable celebrity cameos in music video history and was during a time when his comedic star was one of the brightest in Hollywood. It's been awhile since I've watch the video so this should be fun! 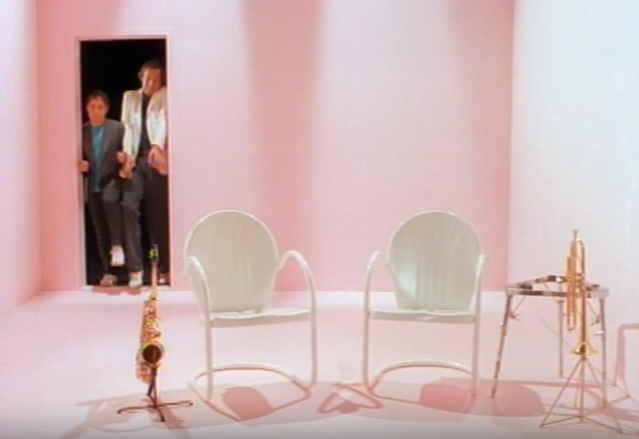 0:04 - Classic gag, both guys trying to enter the room at the same time. 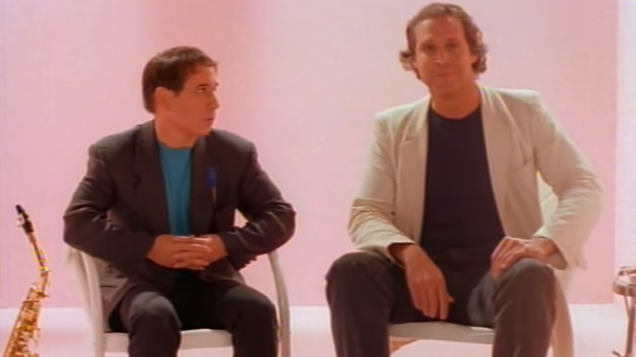 0:09 - I forgot how much taller Chase is compared to Simon. 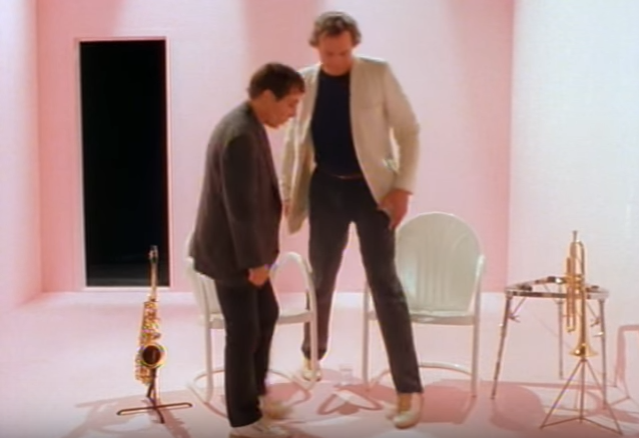 I quick Google search tells me Chase over a foot taller at 6' 4" while Simon is just 5' 3"! 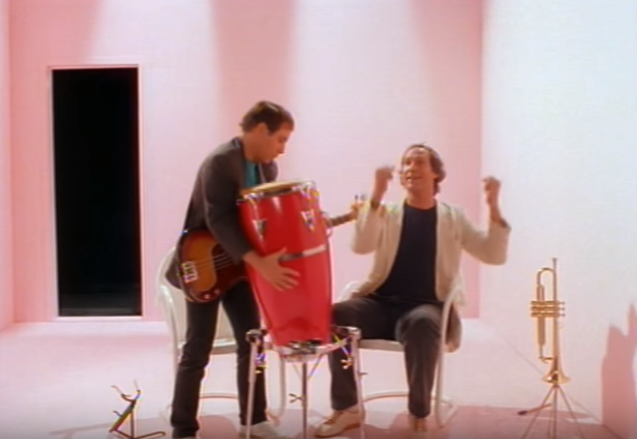 0:33 - Excuse me while I move this Conga drum. 0:45 - I forgot that Simon does actually lip sync the backup vocals. I was thinking he just played instruments and looked annoyed at Chevy singing his song. 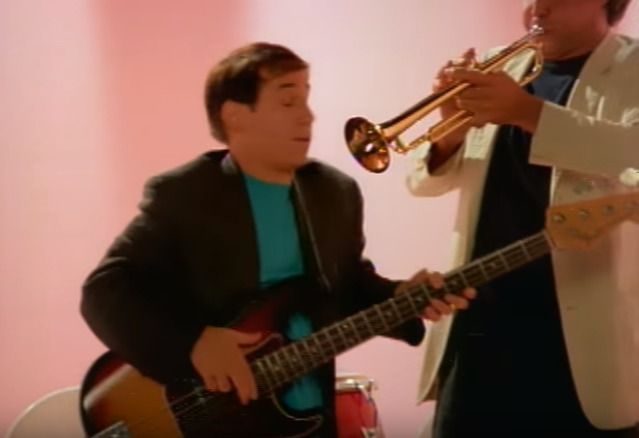 Speaking of which, I wonder if they gave Chevy cue cards or maybe gave him a tape a couple days prior to familiarize himself with the song. The verses cram alot of lyrics in them and imagine it would be difficult from just cue cards. 0:59 - Only a minute in and I've noticed several classic Chevy mannerisms and expressions. 1:46 - Piccolo solo...couldn't name another popular '80s song that has one. 1:53 - All that lip syncing has me parched! 1:58 - Oh I see, it's the old drop-the-glass-through-the-fake-table gag...wait, did it disappear??!! (Rewind) The glass does disappear! (Rewind) I can't believe this! Maybe it's a camera trick? (Rewind) Oh, I can't tell. Watch it for yourself and see if you can see the glass hit the floor. 2:18 - Now this is what I remember! 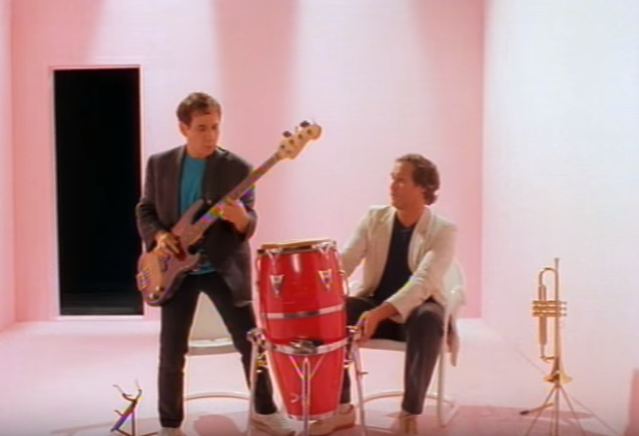 2:57 - So that's what the no-top table is for...Simon also nearly stabs Chevy with that bass guitar. 3:24 - Chevy really knows his na-na-na's...definitely not a cue card job. 3:44 - ...bass guitar riff!!! 3:55 - Director: "Cut! Cut! Simon's off set! Can I get a retake? Hey, why is my crew in a conga line?? Guys? Ah, the hell with it." 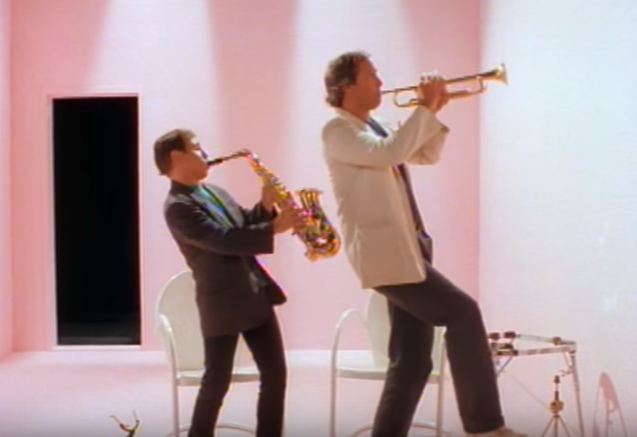 4:19 - I love it how Chevy breaks rhythm so he can shove the horn right in Simon's face. Nearly hits him a couple times. 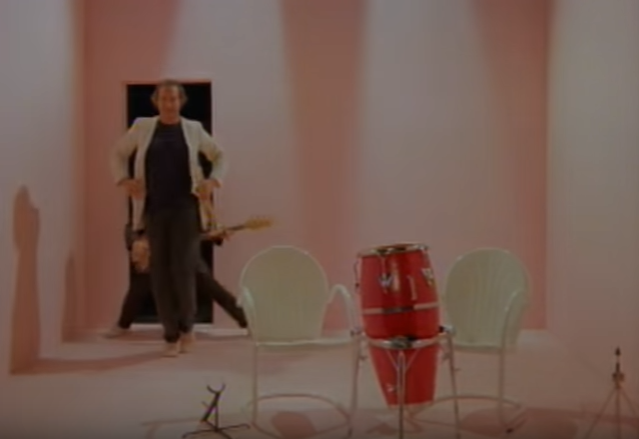 4:33 - As they walk out and fade to black, Chevy looks like he's about to break into some kind of river dance. 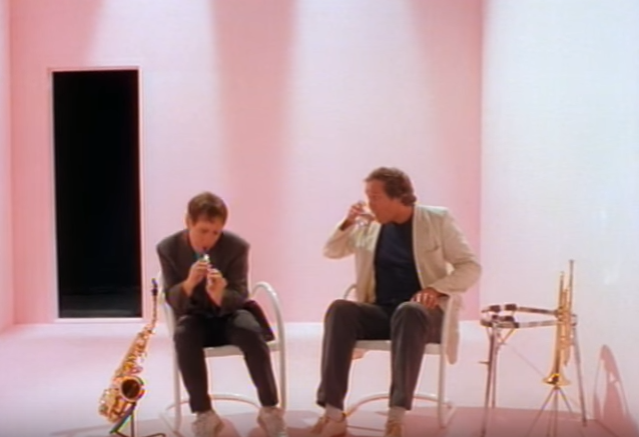 I wonder if they made a director's cut of this video?! Because whatever he did, I bet it would've been the best part! Subscribers can listen to Graceland for free on Amazon Prime music and find more Bodacious Breakdowns on RD80s!